Yes there it is, Leftovers. I started asking myself, “Is this a reoccurring theme in the Bible?” A theme that shows God providing leftovers, more than enough, more than they could eat in one sitting? It’s worth a look. I am going to call it the Theology of Leftovers. There are in fact over five hundred verses that speak about God’s providence, his care for us. There are many verses that tell of his over abundant protection of his people, his superabundance. He provides leftovers in Nourishment, Belongings, Finances, and in Spiritual matters. Just a couple chapters earlier Jesus turned water into wine, not just good wine but great wine in fact better wine than the best wine. Look at John 2:1-11. Psalm 23:4,5 “Even though I walk through the valley of the shadow of death, I will fear no evil, for you are with me; Your rod and your staff, they comfort me. You prepare a table before me in the presence of my enemies; You have anointed my head with oil; my cup overflows.” An overflowing cup is a sure sign of leftovers. Deuteronomy 28:12 “The Lord will open for you his good storehouse, the heavens, to give rain to your land in its season and to bless all the work of your hand; and you shall lend to many nations, but you shall not borrow.” It is only in lending, not borrowing, that there are leftovers. They remembered. The twelve baskets were probably something like picnic baskets, whereas the seven baskets were probably more like a large sack of some sort. The word used by Mark is the same word used to refer to the basket that lowered Paul over the wall in Acts 9:25. It may be a form of a sleeping bag or something like that. Jesus said, “Don’t you understand?” Jesus was stating in brilliant colors that he is the Master of abundance, the Master of Leftovers. It seems that it would have been obvious to the disciples that Jesus could provide more food that they could even imagine and right there in the boat. How many times does Jesus fill the nets of the fishermen, his guys, to the point of breaking, even to the point of swamping the boats. I would like to say that God always provides enough, i.e he doesn’t allow us to starve, or to go without. And I would like to say that he doesn’t provide an over abundance of blessings, to the point that we are throwing stuff away because we just have too much . But both of those statements wouldn’t be true. Or would they? Leftovers, where ever you find them in your life, make a huge statement about the life that you live. If, like our family Christmas celebration, there are an abundant of leftovers in every dish it is a definite sign that we have more than enough in other areas of our lives too. Leftovers make a statement, “We are not living in abject poverty, we have enough to feed ourselves and leftovers for later.” The remains of every meal at my home is quickly put into a container and tossed into the marvelous cooling invention of the early 1900s, the Fridge, not be mistaken for The Fridge. We often have a leftover shmorgasbord for dinner replacing the exquisite meals Kristine usually makes. If you have just sat down to a Christmas meal with your neighbors and the vittles on the table are spread out in front of you and your mouth is watering like a puppy of Pavlov’s and you look around and notice that there might not be enough, you may think to yourself that you should take smaller portions to start with and maybe seconds if there is some leftover. If the plates are scraped clean and the turkey bones are cleaned off and everyone is looking for more, this may indicate that you really don’t have enough in other areas of life also. Maybe you are living in poverty. Where there are no leftovers there are needs. Often in America the opposite can be regrettably true. There can be lots of leftovers, in fact there can be more leftovers than can be used. If any amount of food is thrown away after a meal you have way too much. I have a friend who refuses to eat leftovers, he hates them. He also complains about not having enough money at times. Honestly he has too much money and no matter how much he complains about not having enough, as long as he is throwing leftovers out he will always have to much money. It would be amazing to find out how much food the affluent throw away that could feed the poverty stricken. Dueteronomy 24:19 is all about leaving the leftovers behind for the poor. My favorite leftover meal is lasagna, in fact Kristine will make more on purpose because it is so good on the second day. Mashed potatoes also score high on the list, not as leftover mashed potatoes but fried potato patties, hmmm. Some times I just put a bunch of random stuff on a plate and toss it into the microwave for a quick, “Can you Guess What This Is?” dinner. Having a fridge is truly a blessing when it comes to preserving leftovers, although the fridge can be a curse too. I remember my dad would get pretty peeved whenever he would find a container of food in the depths of the fridge that was taking on a life form of its own. He didn’t have much in his fridge growing up so that kind of waste just wasn’t acceptable. Some leftover food needs to be heated up in the oven to keep it a touch crispy. Microwaved pizza gets soggy. Isn’t it interesting that God gave the Israelites Manna to eat, but told them not to have any leftovers. They were to get just the right amount, if they saved it over night until morning it was full of maggots. I’ll bet it only took one time to figure that out. Exodus 16 tells that story. It seems God could have been trying to teach them to be content with what they have and to trust God to bring more the next day. There was always enough and never too much. A time with no leftovers. They were only thinking about their stomachs at the time God provided the manna, but there is so much more to leftovers than food. There is also belonging, finances and spiritual, all of which the Israelites had just the right amount of throughout the forty years they roamed in the sands of the middle east. Can it be that the right amount of leftovers in each of these four areas are always provided…no need and no waste? That exploration will be next. Studying through the book of John with my students on Sunday mornings has been an amazing adventure. John was so good at his descriptions of feeling and emotions in his writings. This past week we took an intimate look at John 6:1-14. I am sure that over the thirty years of my Salvation Journey I have read this story of Jesus feeding the 5,000+ a hundred times, but this time it became amazing. There on a hill Jesus sat down to teach his twelve, little did they know that they were about to be in the midst of an amazing display of power. Jesus looked up and had compassion on the huge crowd flowing up the hill towards him. Even though this same crowd would some day cry out “Crucify Him,” Jesus loved them; loved them enough to ask Philip where they could find some food to feed all of them. This is interesting because Philip just happened to be from the nearby town of Bethsaida, which most likely only had a few thousand people in the entire town, which would mean these people had been out walking all day, from somewhere else, trying to find Jesus. Jesus sensed they we hungry and tired. Philip and Andrew, and I am sure the rest of the twelve, analyzed the situation and came up with the obvious sequitur – there isn’t enough money or food that could give each person even a scrap of Passover Cuisine. “…Here is a boy with five small barley loaves and two small fish, but how far will they go among so many?” How far indeed. Of course Jesus took the impossible and turned it into a miracle, feeding every person to tummy rubbing goodness. That was amazing enough. He could have stopped there and we would have been awed as we staggered back. But Jesus, no he had to one up himself. He commanded his twelve to gather up the leftovers, a basker for each of them. And…what does his miracle percolate through? Our poverty. 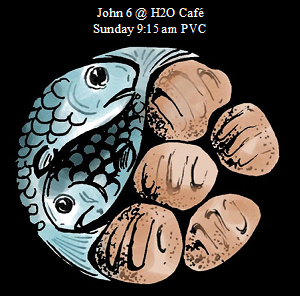 In John 6:1-14, Jesus took “five barley loaves and two small fish,” and produced an abundance. Barley was the bread of the poor and most likely, because it was the Passover, the barley loaves were flat bread, i.e. without yeast-not fluffy. The fish were probably small sardine sized fish. The offering of food was from poverty and turned to greatness. Two final thoughts…I must give God all I have–out of my poverty–and expect him to make it great, because…on the edge of the miraculous is the ordinary and the impossible.